Can a bow that sells for just shy of $1,000 be called a bargain bow? 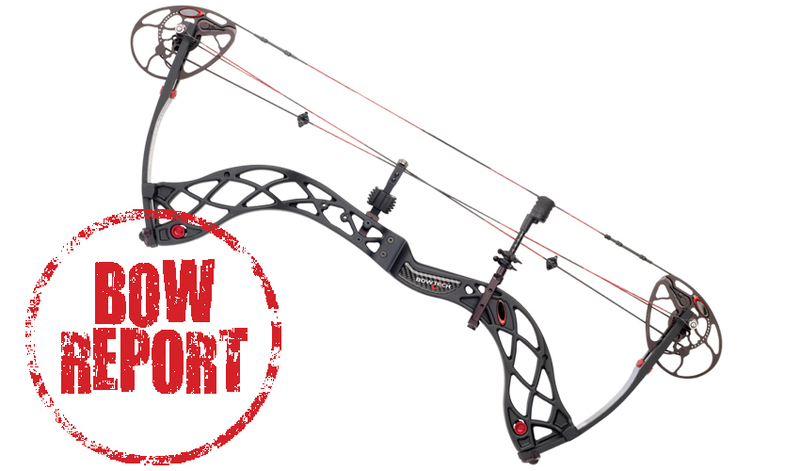 For shooters who want the stability, durability, light weight, and look of a carbon riser bow with the high-tech features, speed, and shootability that BOWTECH is known for, the Carbon Overdrive is certainly a great bow for the money. Last year BOWTECH’s Carbon Knight introduced a carbon riser bow at a moderate price. For 2014 the Overdrive takes it up a notch. It features the super-light carbon Knight riser with the Overdrive Binary cam system and BOWTECH’s FLX-Guard flexible torque-reducing cable guard. It also features Bio-Shock dampeners and Octane strings. The riser is the same Carbon Knight Riser, though some alterations in design contribute to somewhat higher speeds, the most important (as far as speed goes) being a half-inch shorter brace height at 6.5 inches compared to the Carbon Knight’s 7 inches. Axle to axle the Overdrive is an insignificant half-inch longer at 31.5 inches, and is even less significantly heavier at 3.3 as opposed to 3.2 pounds. The draw length is slightly different as well, running from 25 inches to 30 inches compared to the 25.5 to 30.5 inches of the Carbon Knight. Though the cam systems are different, the Carbon Overdrive retains the rotating module feature of the Carbon Knight. Without a press or the need for changing modules, draw weight can be adjusted over the full range from 25 to 30 inches. A limb stop, moved to correspond to changes in draw length, insures a rock-solid back wall. Small hash marks on the cams serve as orientation marks to insure that cams are properly oriented and the string has not stretched. The grip is a very skinny sideplate-style grip. In fact, it’s almost non-existent. Since carbon is not cold to the touch, the sideplate style seems ideal for a carbon riser bow. In terms of appearance, the narrow solid limbs with correspondingly skinny limb pockets make for a sleek look, and the highly reflexed design contributes to BOWTECH’s characteristically aggressive profile. The cutouts in the riser add to a geometric look. The model tested was black, which contrasts sharply with red strings, modules, logos, and a few other hardware items on the bow. There were no visible flaws in fit and finish. In terms of setup, BOWTECH’s carbon riser bows are elegantly simple. The Carbon Overdrive accommodated our test rest easily with no restrictions on vertical or horizontal adjustment. I removed the brass nock that was pre-installed. (OK, here’s a pet peeve: Pre-installed brass nocks are rarely exactly where I would put them, and for the majority of bowhunters who don’t use them anyway, removing them is a bit of a hassle and risks damaging an expensive string.) I eyeballed centershot, aligning the arrow with the string at the vertical center of the grip, and adjusted vertically to align with the arrow rest holes. Arrow flight was good immediately with field points. Draw weight is adjusted by simply turning the limb bolts, with no set screws. The bolts turned smoothly and easily with no sticking, slipping, or chattering. Two things stand out immediately upon first shooting the bow. The first is the super-light weight, the second is the grip. Fans of skinny grips will probably like the Carbon Overdrive’s grip; it is about as close to no grip as possible. The coldness that might be experienced with an aluminum riser is not a factor. I found the grip comfortable, but shooters who like wider or softer grips might not. It is not slick. The draw cycle is somewhat aggressive but nonetheless smooth—that is, it climbs somewhat steeply but with no bumps or hitches, then levels off comfortably for a while before dropping off smoothly and coming firmly against the limb stop. At full draw I found the bow to be rock-steady. (In my experience this is often a matter of achieving perfect draw length, but there is no denying that some bows are steadier at full draw than are others.) Fans of a solid back wall will appreciate the limb stop on the Carbon Overdrive. The valley is not overly wide but is comfortably so. There is neither a sensation of “grabbiness” nor the feeling that letting down from full draw is difficult. The speed is evident. There is a detectable vibration after the shot, but no real recoil or bounce. I experimented with and without a stabilizer, and in the case of this bow decided that any benefit was not worth the weight. Not all shooters prefer lightweight bows, but for those who do the Carbon Overdrive is sure to induce a smile. Its light weight, together with the compact length, makes it a great spot-and-stalk bow. 385 grains 326 fps 316 fps 90.88 ft. lbs. 500 grains 296 fps 286 fps 97.3 ft. lbs. 90.84 ft. lbs. 385 grains 296 fps 285 fps 74.92 ft. lbs. 69.46 ft. lbs.